September 2010. I decided to create a blog. With a few options in mind, but with not many well-established Swansea City blogs around at that time, I decided to create ForzaSwansea.com. When other writings commitments got in the way, I opened the doors to a handful of elite contributors. Since its humble beginnings in 2010, Forza Swansea has gone from a handful of friends criticising our writing to being read over 200,000 times by a daily global audience. 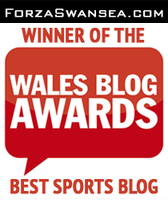 In September 2012, on the eve of the blog's second birthday, Forza Swansea won Best Sports Blog in Wales at the Wales Blog Awards in Cardiff. To this day, the same passion, wit and charm resounds through Forza Swansea. Our new breed of hard-working, passionate writers strive to bring you the latest news and opinions.